Today, China’s National Bureau of Statistics (NBS) released the end-of-the-year GDP figures of 2011. According to official tallies, China’s GDP grew 8.9% in the 4th Quarter, a steady but modest decline compared to 9.7% in Q1, 9.5% in Q2, and 9.1% in Q3. GDP growth for the full year was 9.2%. Earlier today, I was interviewed on BBC about what these numbers mean. You can watch the interview here. You can also read my comments to the Washington Post here. There are two pieces of data I saw today, easily lost in the fine print, that I found particularly revealing. First, the NBS disclosed that real estate investment accounted for 13% of China’s GDP in 2011 (compared to Stephen Roach’s estimate of 10%), and grew at a rate of 27.9%. However, I noticed something that I admit I missed before, in my earlier calculations — that this is a nominal rate (not adjusted for inflation) whereas the GDP growth rate figures are real (they take inflation into account). The real (and therefore comparable) rate of expansion for real estate investment in 2011 was 20.0%. So I went back and re-ran the numbers, using these more accurate figures. 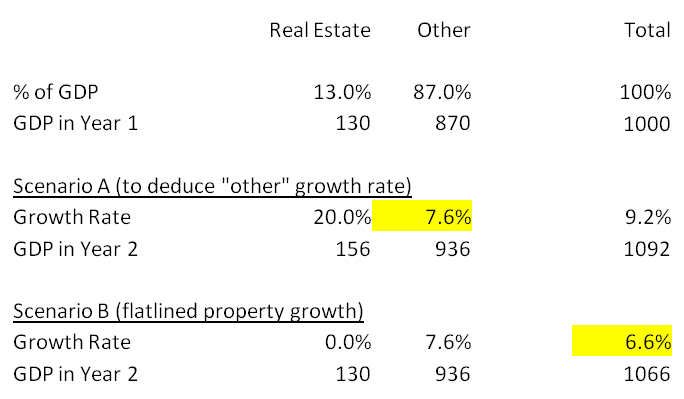 Given GDP growth of 9.2% (a higher starting point than I used in my initial calculations), a real growth rate of 20.0% for real estate implies a real growth rate of 7.6% for the rest of the economy. If, in 2012, real estate construction were merely to level off at zero growth, and the rest of the economy was unaffected, that would bring overall GDP down from 9.2% to 6.6%. That’s higher than the number I initially came up with, but still well into “hard landing” territory. The fall-off of 2.6% is also closer to the 3.0% drop I initially calculated than the 1% decline predicted by Stephen Roach. I errored in my back-of-the-envelope exercise, but my point remains a valid one. Keep in mind, these calculations assume no impact on dependent industries like steel and cement, no impact on the financial system, and no correlation to related risks in the Chinese economy — the latter two of which I will expand upon in my next post of the series. How realistic is a leveling-off of real estate investment? This is where the second piece of data I noticed fits in. The NBS — somewhat curiously– did not publish December figures for property and other fixed asset investment. However, the Financial Times did interview Wei Yao, an economist at Société Générale, who made some of his own calculations. According to him, the growth rate for real estate investment saw a rapid deceleration from 20.1% in November to 12.3% in December (it’s clear from looking at the original source data that these are nominal rates; the real rates to plug into the GDP equation would be substantially lower). The FT article also notes a nearly 25% decline in new housing starts in December and a 26% year-on-year rise in unsold property. And it’s not merely real estate investment that’s decelerating. Nominal growth in fixed asset investment as a whole — hitherto the main driver of growth in the Chinese economy — dropped from 25% y-on-y in October to 21.2% in November and 18.5% in December. That’s precisely the kind of broader deceleration I’m going to be focusing on the next installment (Part 2B) of my analysis. The result is that developers’ inventories of unsold property at the end of 2011 were 26% larger than a year before and equivalent to 30% of total property completions in 2011 … as they say, the bigger they are … ! I would add that the cement, steel and aluminum industries have been adding significant capacity in the past few years. Profitability is very thin with most companies unable to repay principal unless growth continues. Even at the 20-30% growth rate mentioned above, all but the few best competitors would be unable to begin to repay debt. But that’s ok because all lenders worry about is balance sheet leverage (liabilities as a percentage of assets no more than 75-80%) and accrual profit (no matter how thin the profit margin). Much of the debt is short term and many companies have negative working capital, a problem that Chinese lenders seem to ignore. As long as the herd of bankers continue to extend the maturities of their “working capital” lines then there is no problem. This is Wei Yao (Socgen). Thanks for quoting my research. I agree with you on the point that there will be a lot of pain felt by the whole economy as the property sector corrects. However, the former can be taken as the part of GDP related to property sector’s upstream suppliers (steel, cement, etc) and so is actually a good idea to include. But, I am not sure about the inclusion of land value. Developers always claim that 30-40% of their cost is land, while there is also cost – albeit lower than it should be – for local governments to acquire land. Hence, 10% is not too much an understatement, I would say. Of course, there is the downstread demand (decoration, durable goods, etc) and the connection with the banking sector (both shadow and formal). With predicting a hard or soft landing. Of construction, would have to be doubling. There’s a gentle descent to the runway. The adjustment for inflation for property is interesting but can we have instead a metric which would be de-biased from money unit which is completely distorted all around the world? Currencies do not do anymore what they are supposed to do, which means money is not stable against a basket of commodity. It is not anymore a fair medium for both the borrowers and the savers. It means that there is increasing distrust of currencies all around the world. Funnily IMF and EU are coming with 1 trillion each to “solve issues”. Coming back to my point, do you have a sense of property in terms of units growth rather than a number which is distorted first in its reporting and then an attempt to un-distort it with inflation adjustments. Comparing floor space built in one year versus the other and the amount of floor space inventory one year from the other and floor space sold makes the comparison true, as opposed to introduce a monetary dimension (measurements in currency) which obscure the comparison rather than help in the comparison. Analysts and economists do not have to use the rather farcical nominal GDP targeting that Goldman Sachs is now asking for in the US, focusing on units is a repudiation of this distorted measurement system. I have been following your posts for a while and I share your point of view about the real estate market in China. I believe there is a big bubble in the Chinese market. When will it burst? don’t know, maybe we are starting to see the collapse of this bubble, maybe not. What will be the consequences? I am not sure, because the financing in China is even more complex and darker than US, so it’s difficult to assess on how much leverage are taking the companies and who is involved. The statistics for Chinese economy are at least doubtful, so any prediction about the effects of slowdown in real estate market is a very hard task. – To my understanding the (real) GDP measure, is basically a “quantity” index. It takes some base year prices and measure the change in output, but not the change in price. – The figures for real estate market usually mix the change in quantity and also in price (when they report a increase/decrease in sales). – As Wei Yao pointed before, the GDP is focused on added value metric (you can measure from different point of view but this is the essential issue). – Real estate figures include the cost and the value added component. The value added have to take in consideration inputs (steel, cement, labor, etc.) and the cost of the land in order to have a good estimate of VA value for GDP. – Even if the prices drop to halve, the impact on GDP it’s none unless the quantity drops also. So the important thing (for GDP, which is probably one key figure for Chinese government) is How much quantity is now being build, how many new projects are starting. – If the government can start new “public infrastructure” project, like more high speed train lines, highways, ports, etc., I believe they can offset at least in part the drop in private investment. – The sales price are not so important for GDP measure, “as long as you built it… eventually buyers will come”. The high prices might be a key factor for social unrest, but so is unemployment, so the government may prefer to keep building even if it’s not so profitable. – If the government have the funds we could expect a strong jump in public investment in infrastructure. The problem is does the government have enough funds to do this? seems that local government has already relied on land sales to get funding and they are full of debt that have repay in next years. The central government can help, but maybe will be very limited helping local government and the banks.Future seems very uncertain. I think your point about unemployment being a serious threat to stability is right, but not the medicine. Assuming the government has the money to not only match current infrastructure spending but actually increase it each year (the professor’s 0% means a maintaining of this year’s spending, not a decrease), there are more dangerous situations than an expected decline in employment. Gross wasting of taxpayers’ funds that could better be spent on healthcare or education is one danger, along with the danger of building shoddy bridges or railways that can injure passengers. Building big Infrastructure projects probably employ more people than hospitals or schools, but which one is more beneficial to society? Sooner or later they are going to need to make the adjustment away from so much fixed investment, and the longer they wait, the harder its going to be. that’s right andao – its a pity the Chinese household sector isnt large enough to pick up the slack as it does in many western countries. throwing more and more $$$ at the ‘problem’ isnt a solution, it perpetuates the original problem of structural spending imbalances, sigh. FT Alphaville » Is Chinese real estate nearing a tipping point?